IT'S the grand final showdown few My Kitchen Rules fans saw coming. Adelaide's feisty Italians Carmine and Lauren will face off against sisters Tasia and Gracia in tomorrow night's grand final after dispatching Anna and Jordan in tonight's semi-final. Carmine and Lauren have been one of the most inconsistent teams in this year's competition, regularly having to battle their way out of sudden death cook-offs to avoid elimination. But the outspoken cooks and self-dubbed comeback kids comfortably beat Anna and Jordan by 10 points thanks to all of that experience under pressure. Carmine and Lauren strayed outside of their comfort zone of Italian food with their three-course menu, but stuck to classic flavours. In contrast, Anna and Jordan's experimental entree, which was meant to resemble a shoreline, left a bad taste in the judges' mouths. "The oyster cream is just full-on," Manu Feildel said. Liz Egan, who had a piece of shell in her dish, called the cream "slightly unpleasant". The preparation of the main course was just as frantic for Anna and Jordan, who were forced to serve a delicious but poorly plated angel hair pasta to the judges. The mother and son finished on a high with a perfect cannoli but it wasn't enough to beat Carmine and Lauren's more consistent performance. "I'm so proud we've done this together, it will be something I will always cherish," Anna said. 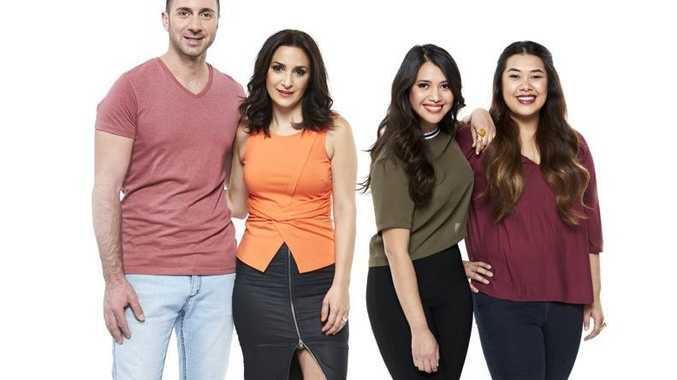 The My Kitchen Rules grand final airs tomorrow at 7.30pm on Channel 7.